STYLISH APPEARANCE - Unique transparent design makes it almost invisible which is quite suitable for nice home decoration. UTILITY HOOKS - Jwxstore Adhesive Hooks is widely used in bathroom, outdoor, kitchen, decorations including ceiling hooks, coat hooks, key hooks, plant hook, bath towel hook, picture hooks. EASY TO USE - Easy to paste and won't damage your walls, no need to nail and drill. Easy to remove and re-position without surface damage, Can be utilized repeatedly after cleaning and dry. TRANSPARENT DESIGN - Perfect Adhesive Wall Hooks,almost trace-less and invisible. Ceiling hook adhesive be made of solid stainless steel and PC construction, ensuring quality and longevity. 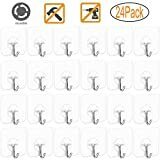 SELF ADHESIVE HOOKS - Size: 63mm(L) * 63mm(W). Up to 22lb / 10kg per hook on wall & ceiling. Super waterproof and oilproof. 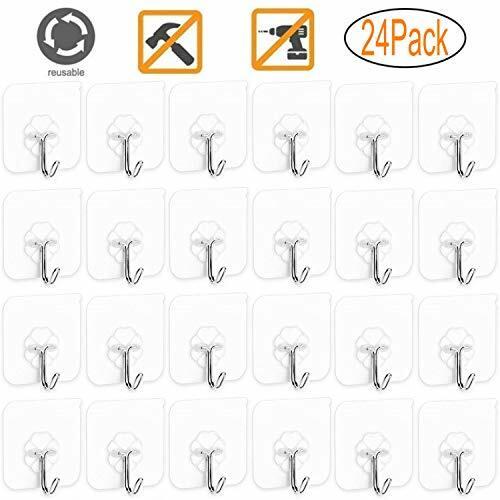 1 pack of 24 Damage-free hooks can almost meet the daily needs of the family. Unique gift.